The Likuid-CBR© ceramic membrane filtration system has been conceived for small MBRs up to 500m3/day, that treat industrial wastewater, compact depuration systems, decentralized wastewater treatment plants and any depuration system in which it is important to achieve high quality treated water in robust treatment systems, with minimum operation and maintenance requirements, small footprint and high depuration efficiency. Highly hydrophilic ceramic membranes of CBR® series provide high stable fluxes, minimizing the fouling phenomena, as well as being regenerated with a wide range of cleaning reagents and chemical cleaning conditions. Ceramic membrane provides maximum reliability in pore size distribution and obtains disinfected water, free of SS and turbidity, suitable for reuse or tertiary treatment as RO. Minimum footprint is required, since CBR® series ceramic membranes are able to operate with high SS concentrations in the biological reactor (up to 25g/L), allowing a compact and robust design of the bioreactor. 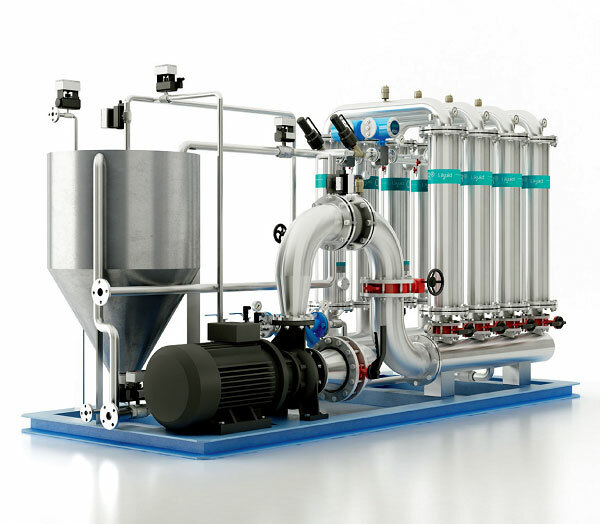 It is a robust system, able to operate in a wide range of SS concentrations, which handles organic load and contaminant peaks, due to the easy recovery with a wide range or reagents and chemical cleaning conditions, even with steam. Due to the low F/M ration, as well as the small size of flocs that are generated, the endogenous growth is accelerated and the biological sludge production rate (kgTS/kgCOD) can be the lowest in the market, even reaching the zero sludge production in certain conditions. Due to the efficiency and to the high concentration of active biomass, the system can operate with high volumetric loads (up to 10 kgCOD/m3day). Moreover, the biomass retention inside the bioreactor and the associated high SRTs, allow the growth of highly specialized biomass able to assimilate complex substrates and remove substances that are considered non biodegradable in the conventional systems. Further information on Likuid Nanotek can be found at our Downloads page.